Whidbey Island is set in the upper reaches of the Puget Sound north of Seattle. It's a narrow island some thirty five miles in length as the crow flies. Its convoluted coastline contains settlements set in ordered landscapes: Oak Harbour is the largest. Southern access is by ferry from mainland Mukilteo and from the north across Deception Pass Bridge. 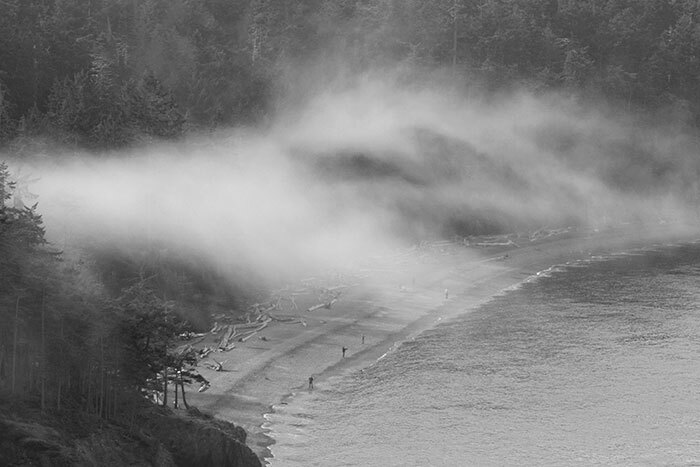 This image made from the bridge shows sea mist over North Beach in the Deception Pass State Park. The first contacts between the Island's indigenous peoples and Europeans came at the end of the eighteenth century. In 1791 Captain George Vancouver of the Royal Navy left England on four year world circumnavigation, sailing in the HMS Discovery accompanied by HMS Chatham. The voyage included long and highly detailed surveys of the American west coast from California to Alaska. 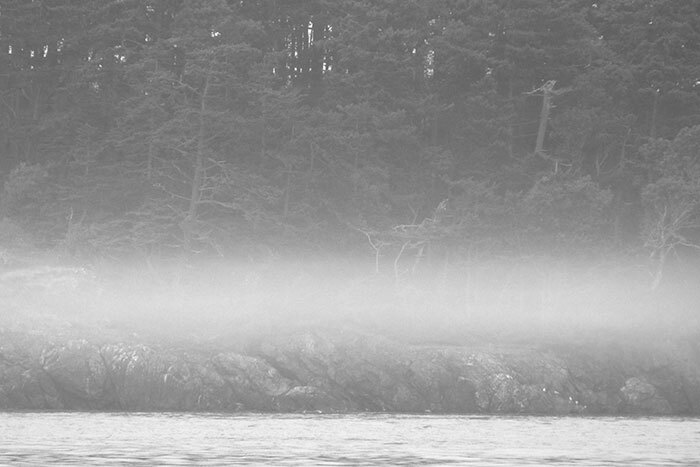 Surveying the multiplicity of islands off the northwest coast must have been an exacting task. Camano Island lies between Whidbey Island and the mainland. Explored first from the south it was thought that there was no way through to the open sea to the north. 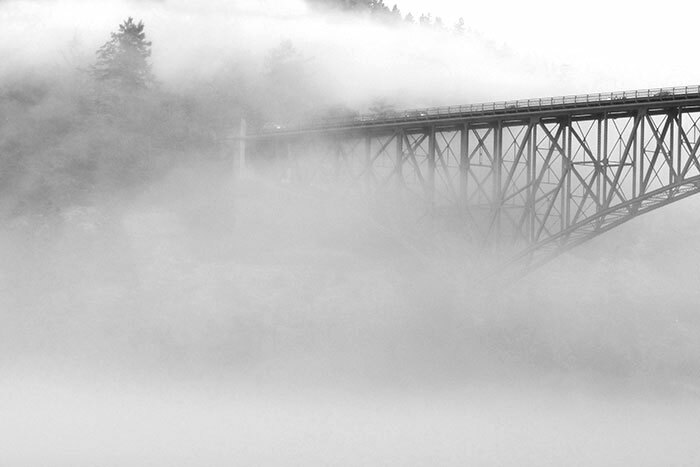 The later discovery of the narrow strait that Vancouver named Deception Pass was unexpected. 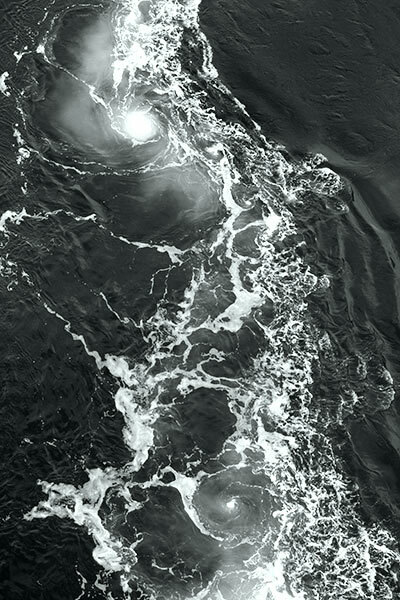 Tidal waters rush rapidly through the two narrow channels flanking the high rock mass of Pass Island to generate rough water, roiling currents and whirlpools. A plaque by the bridge records: "NAMED BY CAPTAIN GEORGE VANCOUVER, 10 JUNE 1792. FEELING THAT HE HAD BEEN "DECEIVED" AS TO THE NATURE OF THE INNER WATERWAY, PORT GARDNER (NOW SARATOGA PASSAGE), HE WROTE ON HIS CHART "DECEPTION PASS". HE HONORED MASTER JOSEPH WHIDBEY, WHO FOUND THE PASSAGE WHILE COMMANDING A SMALL-BOAT CREW OF EXPLORERS, BY NAMING THE ISLAND "WHIDBEY". In nineteenth century expeditions by any nation it was usual to name landscape features after expedition members or people eminent in their home country. Amongst names bestowed by Vancouver was "Puget's Sound", named for a Lieutenant Puget to reward his contribution to exploration in the area. Vancouver Island needs no attribution although it's actually a later diminution of the original Quadra & Vancouver's Island. That, and names such as Camano and Fidalgo Islands are a reminder of contemporaneous Spanish activity in the Northwest. Construction of the bridge took eleven months to its opening on July 31 1935. The single arch northern span links Pass Island to Fidalgo Island and the mainland beyond at a length of 511 feet. 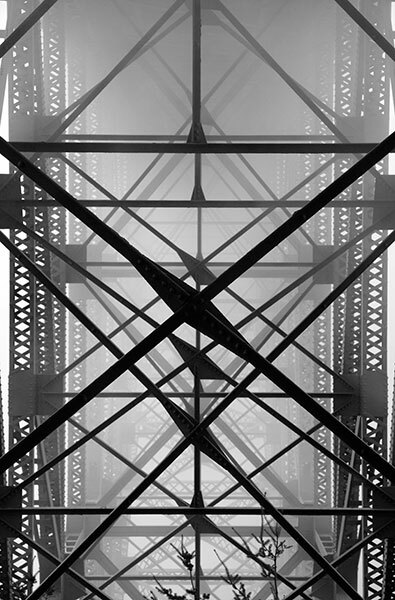 A double cantilever span of some 975 feet crosses the southern waterway. Depending on the state of the tide, the two-lane highway and its sidewalks are around 180 feet above the water. 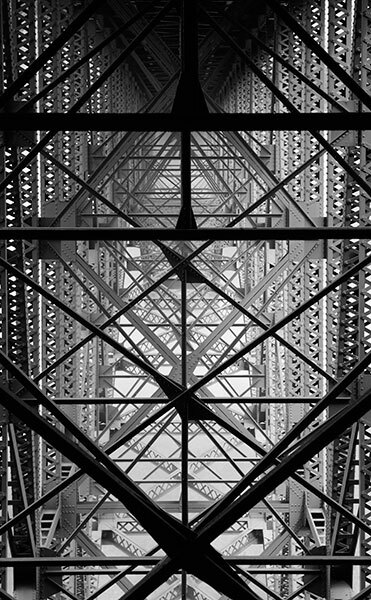 Under-bridge footpaths created by walking boots rather than by design allowed close inspection of structural forms and these images of engineering geometry. The descent to North Beach follows a twisting and sometimes steep path through mature trees. 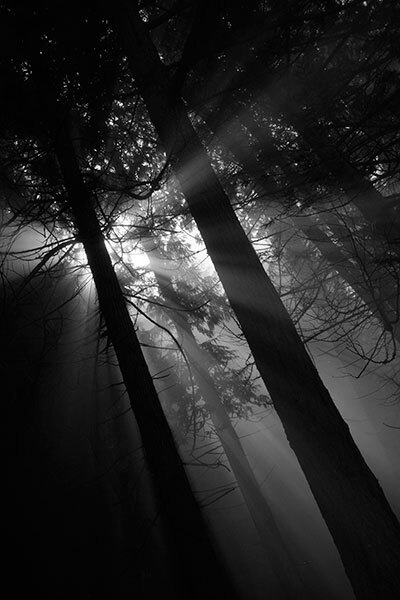 The morning sun was high enough to create strong contrasts as it struck down through these tall conifers. Along the back of the beach the pathway levels out over sand, fine stones, grass and drifting leaves. Bird song and small breaking waves added a sound commentary. The path leads to West Point and turns south along a straight sandbar enclosing the fresh water Cranberry Lake. There are numerous and regulated campsites dispersed in the woodland beyond so weekday walks offer something nearer solitude. The Park covers some four thousand acres. 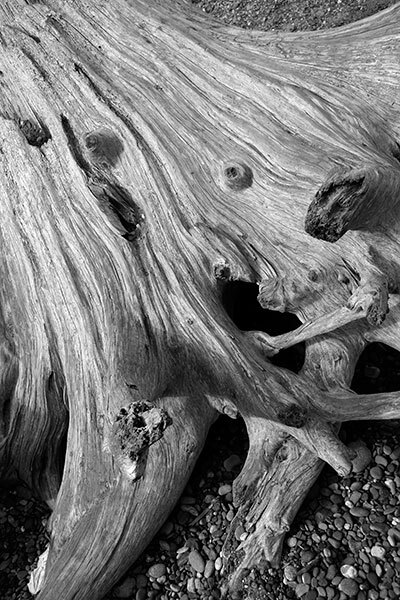 Weathered driftwood is common on northwest shorelines. Accumulations of trees of all sizes can be considerable on the open Pacific coasts such as the Olympic Peninsula or Vancouver Island. Quite modest here, their smooth bleached forms are emphasised by the dark but mist softened vegetation beyond. 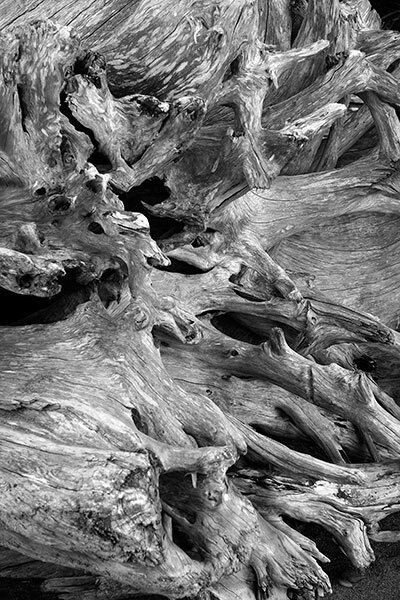 The worn, polished and bleached timbers assume abstract sculptural forms. Root structures are intricate whilst trunks are simple when shorn of branches and bark. 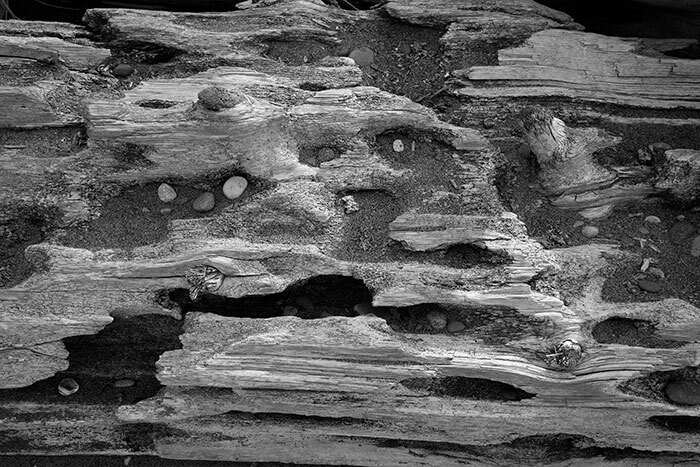 Decay in this one has eroded negative forms that shelter sand and small pebbles. 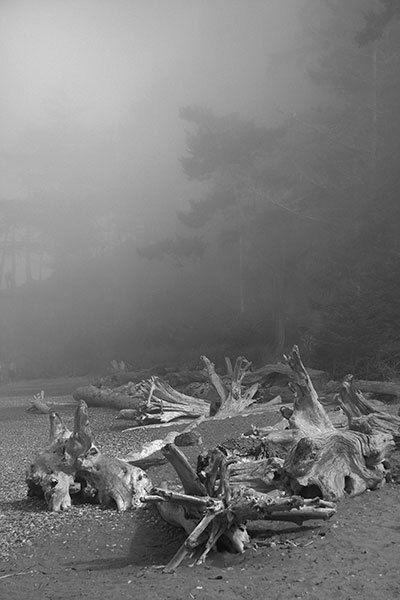 The drifts of sea mist persisted throughout the day in mild air and intermittent sunshine. 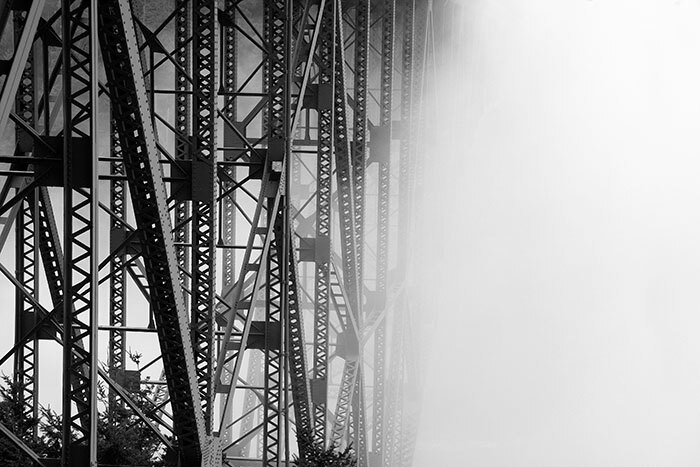 The southern span of the bridge arched into obscurity, with a solitary walker setting a scale. Beach fishermen were casting lines without much sign of a response from the sea. 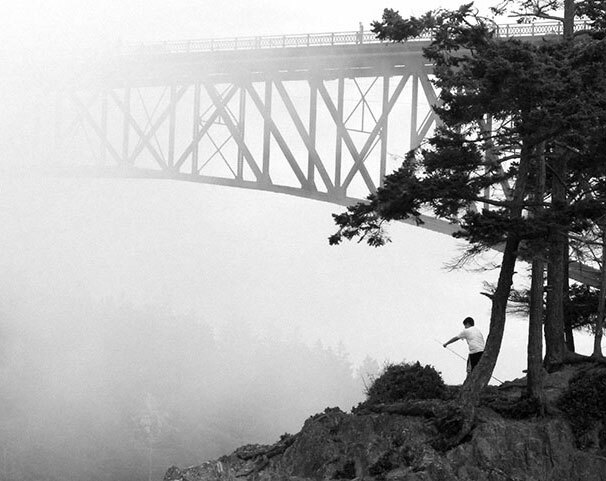 The ocean fog billowed around the north end of the span against the steep slopes of Pass Island. 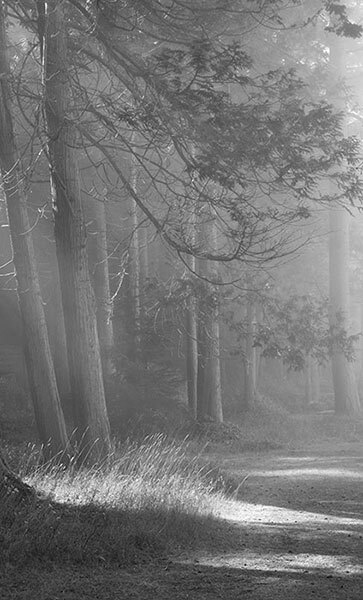 Mist flowed along the woodland covering the steep slopes behind the beach, sometimes revealing a somewhat ragged skyline. This and the final images were made from Western Beach looking out to Deception Island. In contrast to its irregular plan, this gently curved eastern profile of the island is almost symmetrical. 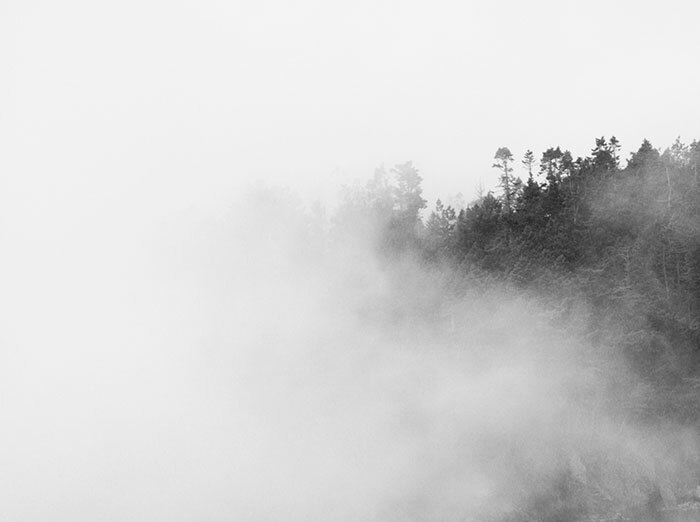 The stratum of water, rock, coastal mist and trees was softened by atmospheric perspective and a long lens. A few days after making these photographs I by chance found a copy of "Landscapes" that presents the black and white photography of Mary Randlett. 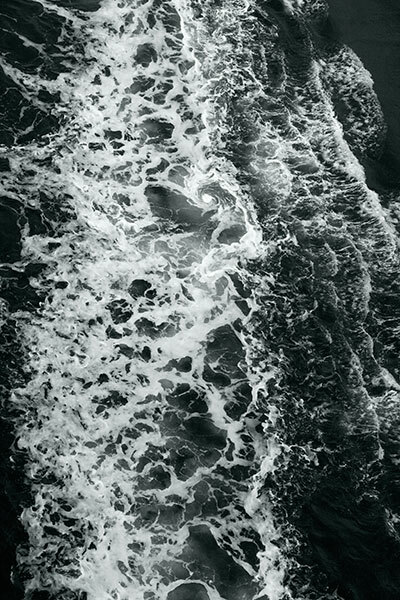 She has explored and recorded across the Pacific Northwest for more than fifty years to create sensitive and uniquely personal images. 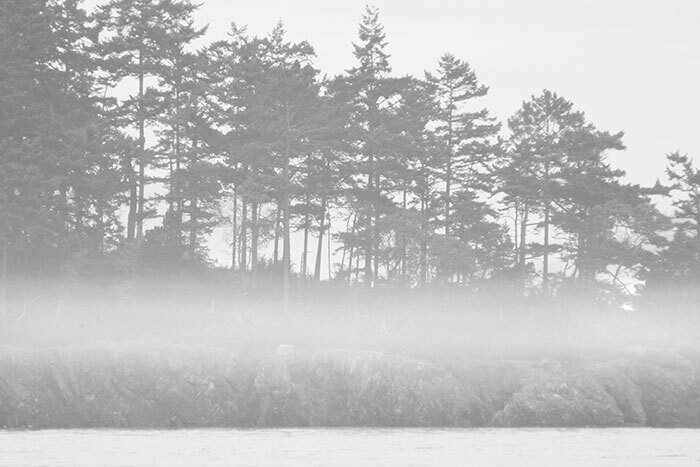 Three in the book are of Deception Pass: the collection itself is inspirational.